Sébastien ESTARAN graduated from a DESS in Structural Biology, obtained at the University of Montpellier in 2005. 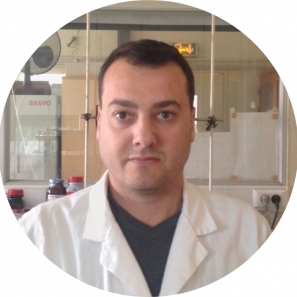 After a first experience as chemical analyst engineer in the pharmaceutical industry, he joined a team at the CBS, a structural laboratory in Montpellier, to work on a Fragment-Based Drug Design strategy to develop protein-protein interaction inhibitors. In 2017, he joined the IBMM as CNRS engineer specialized in molecular interactions studies. Sébastien is currently working at the interface between chemistry and biology with skills in molecular modelling and protein biochemistry. Then using several biophysics technics, he characterizes protein-protein and protein-ligand interactions. « SAR predictions of benzoylphenylurea chitin synthesis inhibitors active on larvae of Aedes aegypti. » Devillers J., Doucet-Panaye A., Doucet J.-P., Lattes A., Matondo H., Lagneau C., Estaran S., Clémente M.-M., and Yébakima A.,2017. J. Devillers, ed., CRC Press, Boca Raton, FL, USA. « Predicting the toxicity of piperidines against female adults of Aedes aegypti, in Computational Design of Chemicals for the Control of Mosquitoes and their Diseases. » Devillers J., Doucet-Panaye A., Doucet J.-P., Lagneau C., Estaran S., and Yébakima A., 2017. J. Devillers, ed., CRC Press, Boca Raton, FL, USA.